Cape Seafood and Provisions, a seafood shop from Michael Cimarusti (Providence, Connie and Ted’s), will open in the former space of Lindy & Grundy. Cape Seafood and Provisions, 801 N. Fairfax Ave., Los Angeles, CA 90046, 323-556-2525. Chef Mark Gold (Eva) presents seasonally inspired California cuisine at SALT Restaurant & Bar at the Marina del Rey Hotel. 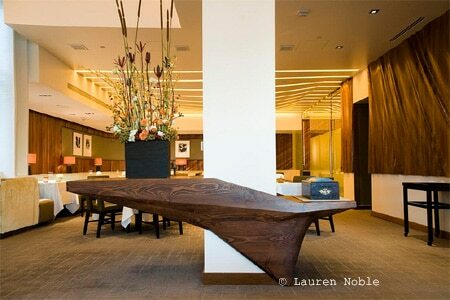 SALT Restaurant & Bar, 13534 Bali Way, Marina del Rey, CA 90292, 424-289-8223. Jaime Martin Del Campo and Ramiro Arvizu have opened Flautas, a fast-casual ode to the traditional Mexican dish of crisp-fried Mexican rolled tacos. 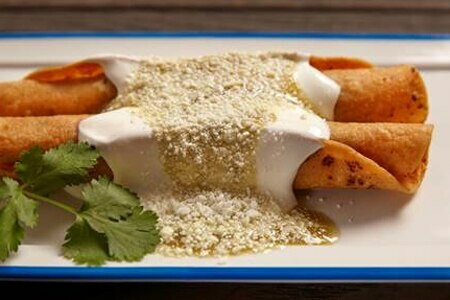 Not to be confused with the ubiquitous taquito, flautas are larger in size, and as is traditional in the chefs’ native Jalisco, are topped with various sauces, salsas and moles. Look for cochinita pibil filled with roasted pork shoulder meat marinated with orange juice and spices. Flautas, Baldwin Hills Crenshaw, 3650 W. Martin Luther King Jr. Blvd., Los Angeles, CA 90008, 323-773-1898. Quinn and Karen Hatfield (Hatfield's, The Sycamore Kitchen) have opened Odys & Penelope for dinner service as of January 12, 2015. The meat-centric concept is influenced by the cooking methods of grilling and smoking. Odys & Penelope, 127 S. La Brea Ave., Los Angeles, CA 90036, 323-939-1033. Matthew Kenney’s Plant Food and Wine is slated to open on Abbot Kinney in early 2015 in the former Axe space. It will offer a selection of locally sourced, plant-based fare, accompanied by an extensive wine list of organic and biodynamic varietals. The 70-seat restaurant includes an open-air courtyard, and décor features reclaimed wood and exposed beams, fire pits and a private dining and wine room. Expect almond burrata with spicy winter fruit and biscotti; roasted cauliflower with concord grape, buckwheat and tarragon; salt-baked baby roots finished with heirloom spelt berries, hazelnut, Meyer lemon and watercress; and mushroom “bouillabaisse” served with black garbanzo, sea palm, braised fennel, saffron and Pernod. Lunch & Dinner daily; Brunch Sat.-Sun. Plant Food and Wine, 1009 Abbot Kinney Blvd., Venice, CA 90291, no phone. A second Chop Daddy’s fast-casual barbecue spot has soft-opened its lunch window on Washington Boulevard in Culver City. Expect favorites found on the flagship Venice menu, including a smoked barbecue pork belly sandwich, pulled pork, brisket and smoked chicken. The new location anticipates a summer opening for the full restaurant, once renovations of the existing dining room are complete. The space will feature 50 seats, as well as beer and wine. Lunch daily. Chop Daddy's, 9552 W Washington Blvd., Culver City, CA 90232, 310-559 5967. Andy Ricker has opened Pok Pok Phat Thai in Chinatown, inside the Far East Plaza. This sibling of Ricker’s New York eatery features a menu of stir-fried noodles including the eponymous Phat Thai (pad Thai) with ground pork or prawns, flat noodles with pork and Chinese broccoli, mussel crepes, and water spinach stir-fried with pork and garlic. Pok Pok Phat Thai, 727 N. Broadway Ave., Los Angeles, CA 90012, 213-628-3071. A posh new Santa Monica eatery, aestus, is now open on Wilshire Boulevard. Executive chef Alex Ageneau (Patina, The Royce) offers a California-influenced, seasonal menu with highlights including a charcuterie board with duck pâté and pork rillettes; grilled octopus salad with fennel, radish and clementine; grass-fed beef with sunchokes, kale and mushrooms; and fire-roasted chicken with potatoes, bitter greens and espelette, prepared on an open, wood-burning grill. Former Spago wine director, Kevin O’Connor creates a wine list composed of old and new world selections, and bar director Marissa Grasmick (The Varnish) mixes classic and craft cocktails. Dinner Nightly Tues.-Sun. aestus, 507 Wilshire Blvd., Santa Monica, CA 90401, 424-268-4433.
dineLA Restaurant Week returns January 19-February 1, 2015. This event offers diners the opportunity to indulge in specially priced menus from a variety of Los Angeles area restaurants. Diners who order Sofritas, Chipotle’s new vegan menu item, on Monday, January 26, can redeem their receipt for a free entrée of their choice upon a return visit any day between January 27 and February 28, 2015. Sofritas is organic, non-GMO tofu braised with chipotle chilis, roasted poblano peppers and a blend of aromatic spices. The offer is good at all U.S. and Canada locations. Chipotle Mexican Grill, 7101 Melrose Ave., Los Angeles, CA 90046, 323-297-0334. Terrine has announced a three-day brunch service (Friday-Sunday) with a menu from chef Kris Morningstar that includes pain perdu with vanilla-battered French toast, sea salt caramel frosting and maple; frisée aux lardons with Benton’s bacon, slow-cooked egg and mustard vinaigrette; spicy fried chicken and grits with scallions and maple; and eggs with spicy tomato sauce, fennel pollen, basil, pecorino and crostini. Brunch cocktails range from an “Italian Soda” with Campari, Cynar and pilsner to a Bloody Mary with heirloom tomato, Monopolowa and spice. Terrine, 8265 Beverly Blvd., Los Angeles, CA 90048, 323-746-5130. Paul Lee has been announced as the executive chef of Patina, the flagship restaurant of Joachim Splichal's Patina Restaurant Group. Chef Lee recently helmed the kitchen at Le Cirque at Bellagio and has also held positions at other fine dining restaurants in Los Angeles, New York and Las Vegas, including L’Orangerie and Joël Robuchon Restaurant. Patina, Walt Disney Concert Hall, 141 S. Grand Ave., Los Angeles, CA 90012, 213-972-3331. Gonpachi, the Japanese restaurant at Miyako Hybrid Hotel in Torrance, closed on December 9, 2014. Gonpachi, Miyako Hybrid Hotel, 21381 S Western Ave., Torrance, CA 90501, no phone.